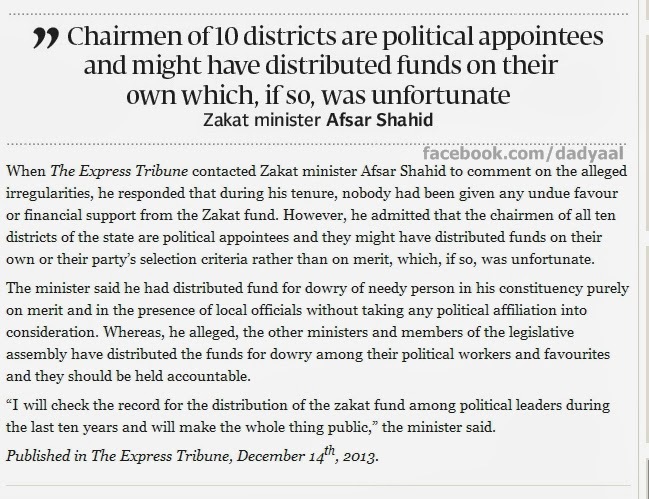 Muzaffarabad, December 2013 : As if misappropriation of funds in general was not enough, the Prime Minister’s (PM) office in Azad Jammu and Kashmir (AJK) has allegedly started interfering with the charitable Zakat fund, according to sources in the Zakat Department. The department has also recently received a handwritten letter from Prime Minister Chaudhry Abdul Majeed directing it to provide Rs200,000 to a Pakistan People’s Party (PPP) woman activist, according to the sources, requesting not to be named. “On the PM’s instructions, Rs50 million from the fund have already been distributed among politicians for their foreign trips and medical treatment. During the last 11 months, funds in excess of Rs8.56 million have been given to former prime ministers, ministers and advisers.” About Rs3 million, earmarked for the treatment of poor patients, were given to some “financially-sound PPP workers.” About Rs80 million were distributed among the voters and supporters of the party. Out of these, Rs10 million, though, were given to the needy families, affiliated with the ruling party. “Besides the unfair distribution of funds meant for medical treatment and dowries for the needy, the premier has disbursed over Rs30 million allegedly to “favourites” without complying with the procedure of selecting beneficiaries, the sources added.